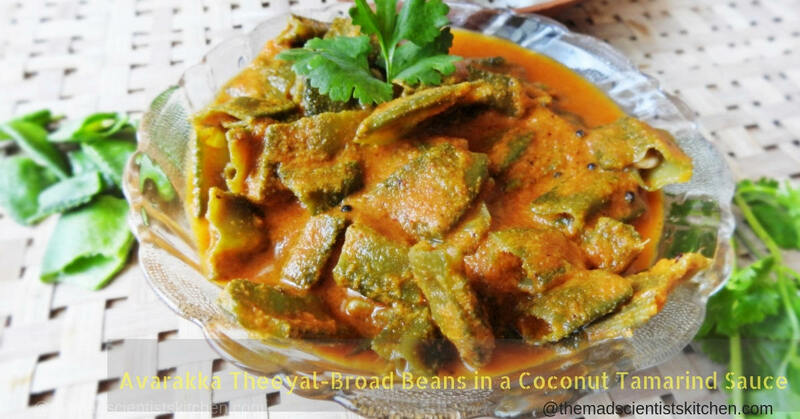 Avarakka Theeyal is delicious Broad Beans in a Coconut Tamarind Sauce. Tangy, spicy and just the right curry to go with rice but tastes just as good with fulkas. Avarekai, as they are called in Kannada, are also called Broad Beans, Flat Beans, also called Papdi in Hindi / Marathi. Generally I cook it as a stir-fry and frankly, at home, these beans are not much appreciated. Therefore, I was apprehensive while cooking the beans as a curry. I was unnecessarily worried. 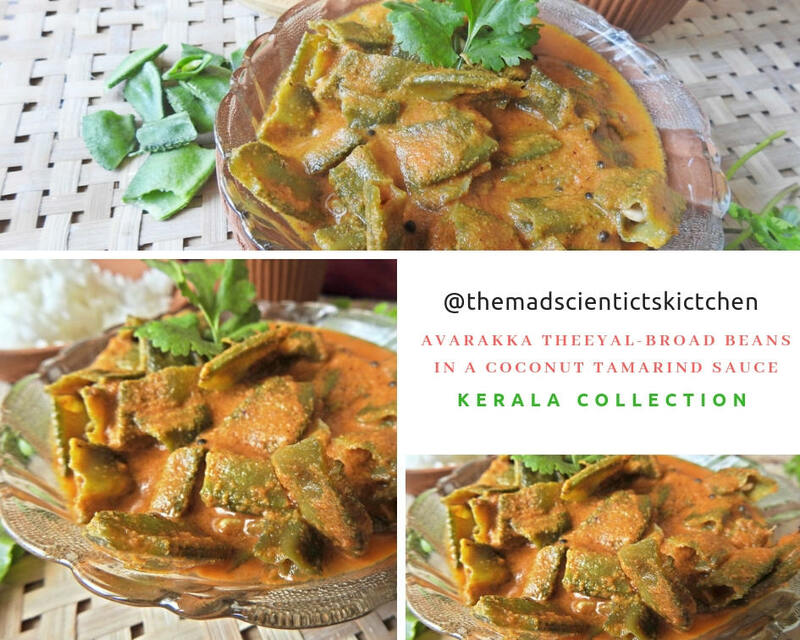 This Avarakka Theeyal or Broad Beans in a Coconut Tamarind Sauce is an excellent example of Kerala Style Cuisine. This month for Ssshhh… Secretly Cooking…, a forum where members are paired with other members and then the fun begins. We already have a chosen state the partners exchange 2 secret ingredients and you are to cook with these ingredients. Interesting? Join us? Now, this month the chosen state is Kerala, and I am paired with Mayuri and she gave me tamarind and coconut oil as my secret ingredients. I gave her dalchini/cinnamon and curry leaves as her ingredients. Kerala has recently been ravaged by floods the worst in the century with over a million people evacuated and 483 people died. The 14 districts were on red alert. The gates for Thirty-five out of the fifty-four dams within the state were opened for the first time in history. The worst was that all five overflow gates of the Idukki Dam were opened at the same time, for the first time in 26 years. I shudder to think what would have happened if the gates were not opened. If that was not enough there were landslides that have left the hilly districts isolated. Be kind and donate to the building of the state, generously! Soak the tamarind in 1-cup water while you start your preparations like stringing and chopping your beans, grating your coconut. For me, it is thawing the coconut that I have in the freezer. Squeeze the tamarind pulp and set aside. You may repeat with 1/2 cup water two more times. (Since our food is not as pungent and sour now I did use all the pulp). In a kadhai/wok add 1/2 tsp of coconut oil and add the onions, stir-fry until translucent then add the red chillies and the coriander seeds roast until you get a lovely aroma. Then add the coconut and roast over low-medium heat until the coconut becomes light brown in colour throughout. It is important to keep stirring to avoid the coconut from burning or even unevenly browning. Cool completely, then in the chutney pot of your mixer grind to a smooth fine paste. Use a little water to help the grinding. Heat the 1 tsp coconut oil and add the rai/ mustard and curry leaves, turmeric. Let the rai/mustard splutter. Add the beans and sauté until it softens a little. Add the salt and the tamarind water and bring to a boil. Cook covered medium heat till the broad beans are cooked and soft. Add the coconut mixture on the beans, mix well bring to a boil. 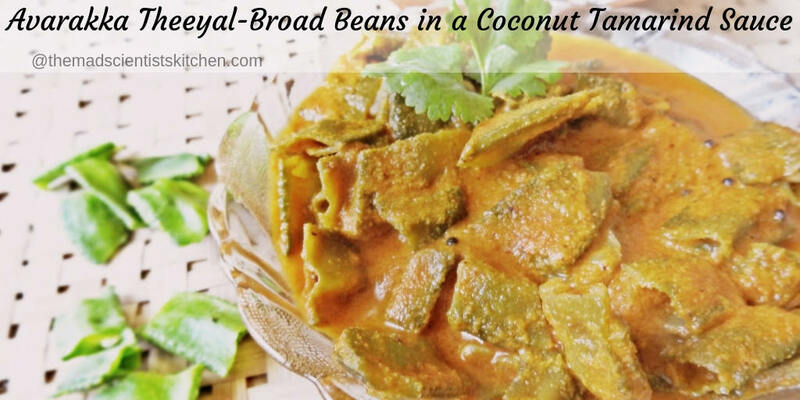 Avarakka Theeyal is delicious Broad Beans in a Coconut Tamarind Sauce. Tangy, spicy and just the right curry to go with rice. I love the spicy and tangy theeyal. goes well with plain rice and appalams. Appams now why did I not think of that? Thanks, Shobha. This is something new and interesting recipe to me. I have never tasted broad beans in this curry style. This looks so inviting, loved to try with chapati. Love broad beans ,..your curry recipe is a bit different from mine, but it looks delicious and with tamarind and coconut , i am sure it must be lip smacking..thanks for the share di. I had board beans curry and fry so many times, but never tried the combination with coconut. I will this recipe soon. Bookmarking this recipe, totally new recipe to me, sounds so delicious and inviting. Me too Priya. But trust me I will use it on a regular basis. Tangy and yummy recipe. When I read your recipe, I felt that tickling in my taste buds. Very nice and new recipe to me. This could definitely make a comfortable meal with rice. Lip smacking good arch! Curry looks tempting, can imagine the aroma of coconut oil and ground masala in the curry!yumm! Perfect with steamed rice!! This curry goes well with steamed rice too. Love this , a comfort food. This looks so delicious! Lovely recipe, and beautiful pics! Reading the name of the dish! Already my mouth is watering! Looks so delicious! My husband adores Avarakkai or Broad beans so every week there is either a sabzi or curry made with it. 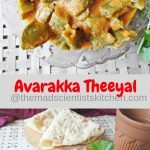 Loved the recipe, the masala paste and the tamarind combination – This theeyal is particularly good with some hot rice, ghee and papads. Will love to see your recipe Vidya. Is it on the blog? One of my favourite recipes! Looks so fabulous! Give a bowl of rice, i can sit and have this avarakka theeyal without any fuss, lipsmacking dish definitely. Broad beans looks so spicy, tangy and lip-smacking. Bookmarking it. Thanks for the recipe. I love broad beans with mustard and poppy seeds paste. Now got a new recipe. I would love to have it with hot steamed rice. Lovely share. I have never tried to make broad beans this way. Surely going to try this. 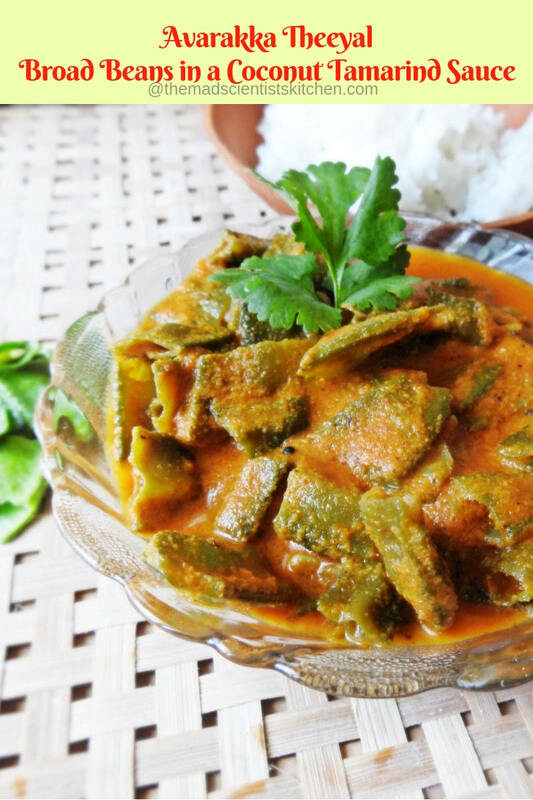 Archana you’ve prepared such a delicious and tempting curry using broad beans. I usually make a dry sabji with them but your recipe is different. Would love to try it out when I get broad beans. This is quite simple to make with a few ingredients. Shall give a try sometime, looks so flavoursome. A simple recipe but the end result sounds utterly lip smacking. The flavours of the roasted onion, chillies, roasted coconut paste melding with the tangy tamarind sauce and the fresh green avarakkai make the curry sound just perfect with hot rice, ghee and rasam. Must try!